"Portrait painting is a fascinating, hard but hugely rewarding profession. You work with so many different people from every walk of life in so many different parts of the world." The selection of paintings on this web site represent work from throughout June's career. They are loosely categorised in the menu below. from the Times Article March 11th 2012. "Put Me In The Picture"
Reproduced from the Sunday Times Article from May 1st 2011. Artist and Illustrators Magazine run an article entitled "Famous Faces" on June Mendoza for the July 2010 edition. "The Artist" Magazine Nov 2000, featured June Mendoza in their Masterclass section. June Mendoza AO.OBE.RP.ROI.HonSWA is a member, amongst other art societies societies, of the Royal Society of Portrait Painters. 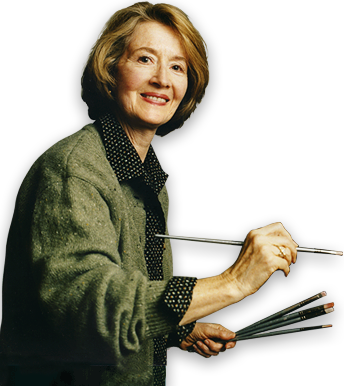 She is one of the world's foremost portrait painters. She undertakes commissions for portrait painting on a wide range of subjects, examples of which are displayed on this Internet gallery. Her commissioned work includes a number of portraits of the Queen and members of the Royal family, foreign dignitaries and a wide range of portraits of personalities from the Arts, Music, Government, Business and the professions. Her commissioned Group portraits include the House of Commons, the Australian House of Representatives, City Guilds and Boards of many companies and institutions. Please enjoy visiting her internet gallery of commissioned portraits and subjects she chooses to paint from all walks of life.